Exploring how the Bible may be appropriately used in practical and public theology, this book looks at types of modern practical theology with specific emphasis on the use of the Bible. Bennett juxtaposes the diversity of modern practical theology with the work of leading nineteenth-century public 'theologian', John Ruskin, and then assesses the contribution of this analysis to some modern issues of public importance in which the Bible is used. The final chapter offers a framework for a biblically informed critical practical theology which draws on the writer's experience and invites the readers to engage their own. Contents: Introduction; Part I Using the Bible - the Reader of Multiple Texts: Introduction; The text of the Bible and the text of life; Putting ourselves in the picture; A tale of two traditions. Part II John Ruskin: ’To See Clearly... is Poetry, Prophecy, and Religion All in One’: Introduction; ’Our national archangel’; Ruskin’s biblical interpretation; On seeing clearly; On prophetic seeing. Part III The Bible and Theology in the Public Sphere: Introduction; A resignation and an interview: the Bible and corporate finance; A crisis and a judgement call: the Bible and international conflict; Towards a biblically informed practical and public theology; Bibliography; Index. 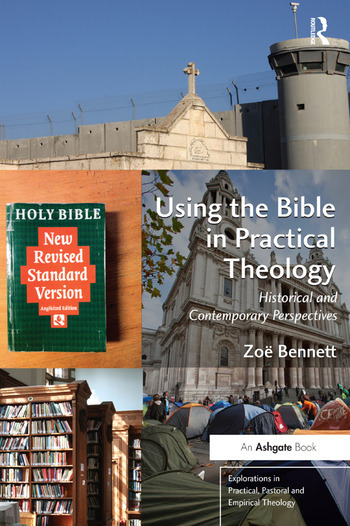 ZoÃ« Bennett has been Director of Postgraduate Studies in Pastoral Theology at Anglia Ruskin University and the Cambridge Theological Federation, since 2000. She directs an MA programme in Pastoral Theology and a Professional Doctorate Programme in Practical Theology and has written extensively on issues in practical theology in relation to feminism, ecumenism, pedagogy, the Bible, and the work of John Ruskin. She is a Reader in the Church of England.